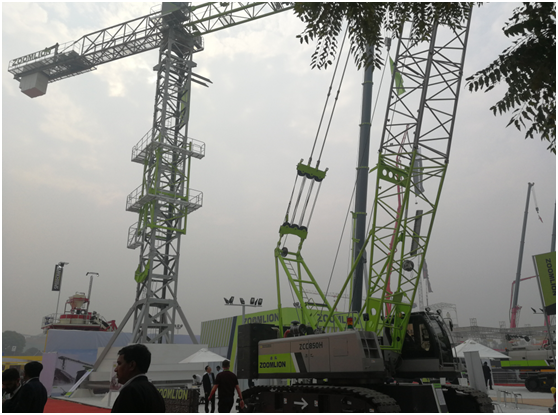 In mid-December, New Delhi International Convention and Exhibition was crowded with visitors from all over the world, as the largest construction machinery expo in South Asia - the biennial BC India - was being held here. Covering 195,000 square meters, the exhibition area exhibited construction machineries from more than 700 manufacturers. As a global high-end equipment manufacturer, Zoomlion made a grand appearance at the event with four units of 4.0 products. 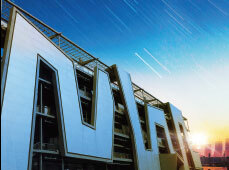 The exhibition was jointly sponsored by Messe München Group (MMG) and Association of Equipment Manufacturers (AEM). Compared with the previous event, BC India 2018 hit a record high in the aspects of exhibition area, exhibitors count, and visitors count. Official statistics showed that the exhibition area was 30% larger, and the number of visitors also grew by over 20%. Owing to the rapid development of transportation industry and infrastructure industry, India’s demand for construction machineries has been increasing all the time. In the exhibition area of Zoomlion, the sellers and the buyers were negotiating, constantly creating new business opportunities. 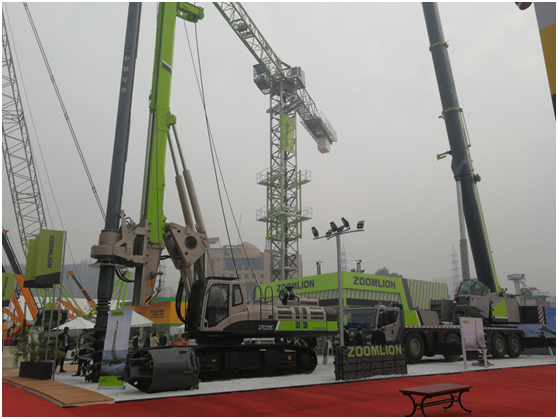 “Zoomlion’s ZCC850H Crawler Crane, ZR220C Rotary Drill, ZAT1500 All-terrain Crane, and T7020-10E Flat-head Tower are all 4.0 products, which will be extensively promoted in the Indian market to facilitate local infrastructure construction,” Zoomlion’s staff introduced at the site. It was introduced that Zoomlion entered the Indian market since the year of 2003, becoming one of the earliest Chinese construction machinery enterprises in India. In 2009, Zoomlion India Private Limited was founded in Mumbai, which greatly boosted the sales and after-sales services of Zoomlion’s construction machinery products. After 15 years of steady development, Zoomlion has accumulated more than 200 important customers, cumulatively sold more than 3000 machineries, including cranes, concrete equipment, earthwork equipment, pile work equipment, and agricultural machineries, and participated in the construction of many key projects in India. “Benefitted from high quality products, sound spare parts, professional and timely services, Zoomlion time and again won recognition from the Indian market. For a long period of time, Zoomlion has been a first-rate Chinese construction machinery brand in India. 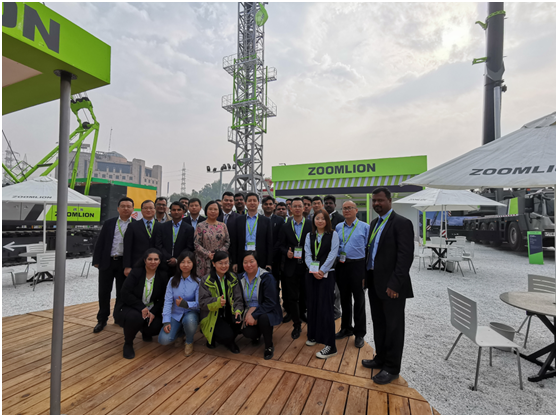 In this exhibition, Zoomlion was visited by more than 200 Indian customers, received product orders of more than 10 million US dollars”, the staff said. Zoomlion has a spare parts warehouse in India with total value of more than 5 million US dollars. In addition, by establishing Zoomlion India Training Center in Mumbai and Maharashtra, Zoomlion built a professional and efficient after-sales service team. This measure strongly guarantees spare parts and service response speed in major engineering projects, winning praises from local governments and customers, and improving reputation of the brand. As a significant strategy formulated by Zoomlion in order to expand in overseas markets, “localization” was well implemented in India. What's more, in response to the actual needs of the Indian market, Zoomlion specially developed medium and small-sized tower cranes for the Indian market, which were manufactured locally. Once launched, these highly customized products were warmly welcomed by customers in Mumbai, Delhi, Kolkata, Chennai and other places. By continuously recruiting localized talents, Zoomlion India has increased the proportion of its Indian employees up to 70%. 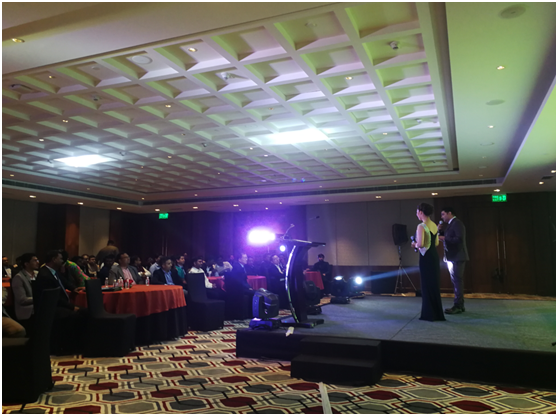 During the exhibition, Zoomlion held a thematic dinner party named “Roaring Back”, which invited nearly 100 VIP customers from India and South Asia to enjoy the event. The name of the party indicated the “roaring back” of Zoomlion, along with its newly upgraded 4.0 products and fully expanded localization strategy for the Indian market. “Shakespeare once said, ‘what’s past, is prologue’, as a global high-end equipment manufacturer, Zoomlion is readjusting its development pace, strengthening power in the Indian market with unprecedented investment, and expanding in the Indian market with a new approach. Zoomlion will fully implement its localization strategy in the aspects of manufacturing, R&D, sales, service, and spare parts. Zoomlion is roaring back. Zoomlion is making good products, improving its network, optimizing after-sales service, and developing the Indian market with the attitude of building a one-hundred-year brand, being responsible for customers and local staff, developing and growing together with customers”, Liu Yan, Zoomlion Overseas General Manager Assistant, said at the dinner party.